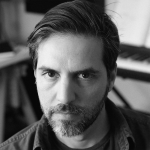 Our collaborating researcher Martin Jaroszewicz is a composer, multimedia artist and educator based in Los Angeles. His research focuses on the development of technologies and theories for human computer interaction in spatialized electronic music. He began his music career at the conservatory of music in Argentina and obtained an MFA and PhD at the University of California. His thesis on spectral spatialization is a technological and theoretical framework for composing with moving sounds. Dr. Jaroszewicz has been in residence as a research scholar at UC Mexus investigating musical gesture and emotion. His music has been performed in the Americas and Europe.